This is a sponsored conversation written by me on behalf of Butterball. The opinions and texts are all mine. 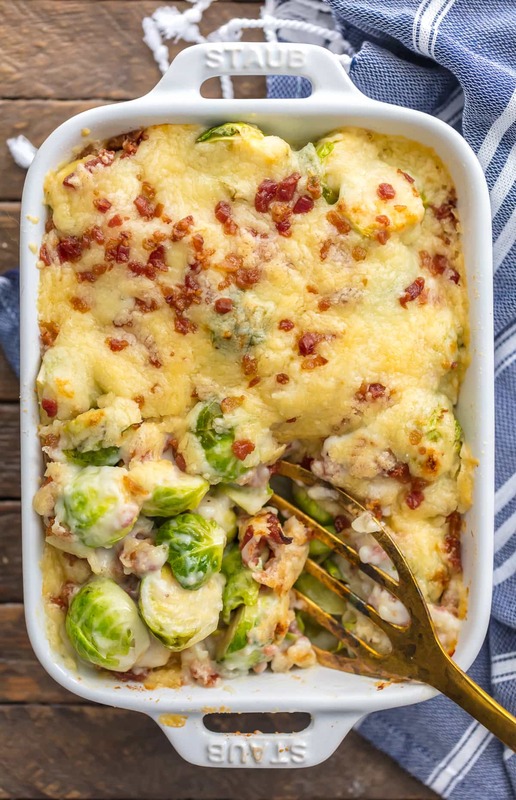 BRUSSELS SPROUTS GRATIN with bacon is the ultimate holiday side dish! Who can resist bacon brussels sprouts when sprinkled with SO MUCH CHEESE? 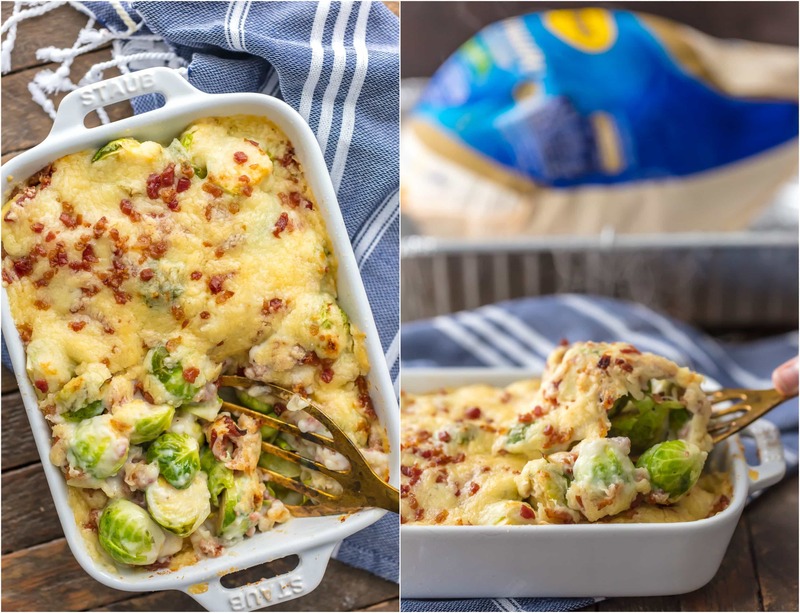 The creamy sauce inside of this brussels sprouts au gratin is so easy and delicious, making this a Thanksgiving favorite for our family. Brussels Sprouts Gratin is a cheesy, creamy dream of a holiday side dish! 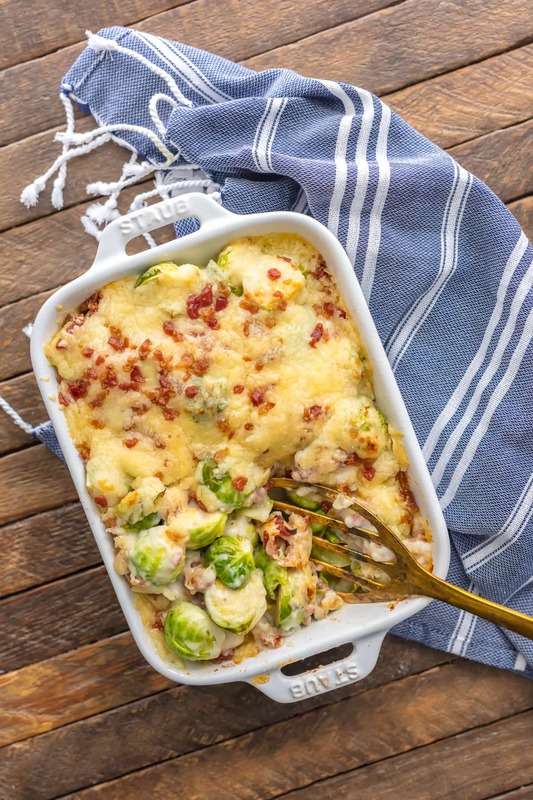 This Bacon Brussels Sprouts Au Gratin recipe is sure to be a family favorite! This Brussels Sprouts Gratin recipe is getting me so excited for the holidays! Can you believe Thanksgiving is THIS WEEK?! I literally cannot believe it. Where has the year gone? All of a sudden we are standing at the edge of my favorite time of year, THE HOLIDAYS! There’s no better time for a foodie than Thanksgiving and Christmas, and they are literally going to be here before we know it! I’ve been posting a lot of favorite Thanksgiving recipes in the past couple weeks, but I’ve saved the best for last! This SUPER EASY Bacon Brussels Sprouts Gratin is one of my all-time favorite side dishes. It’s the ultimate way to eat your greens! Who can resist brussels sprouts when they are tossed in a creamy white sauce, sprinkled with tons of bacon, and topped with loads of white cheddar? I know I can’t! This Brussels Sprouts Au Gratin recipe definitely need to make an appearance this holiday season. Even if you don’t usually eat Brussels Sprouts, this cheesy bacon filled version will surely impress you! Brussels Sprouts Gratin is the perfect Thanksgiving side dish. 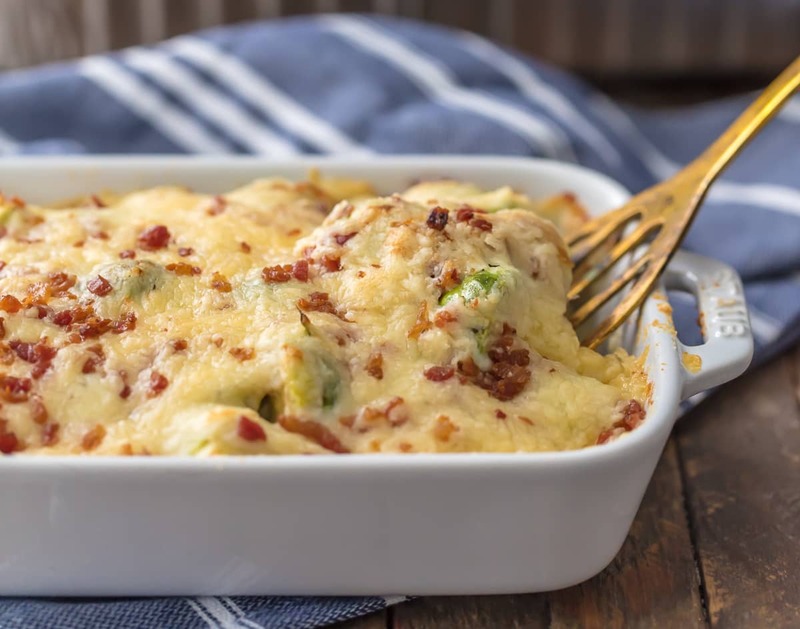 Vegetables, BACON, cheese, and a creamy sauce. What more could you want? A lot of people seem to fear brussels sprouts, but that’s just silly! If you’ve never been a fan of this veggie before, you will be now. 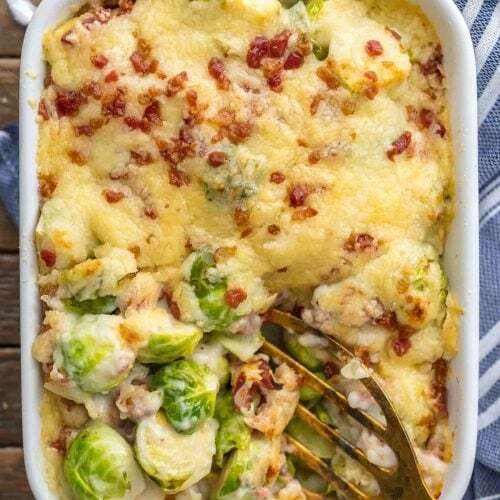 Brussels Sprouts Gratin is filled with bacon and cheese, so it’s definitely full of flavor. I mean, how can you resist cheesy, bacon brussels sprouts? Trust me on this one, you’re going to want to make this dish for every holiday! 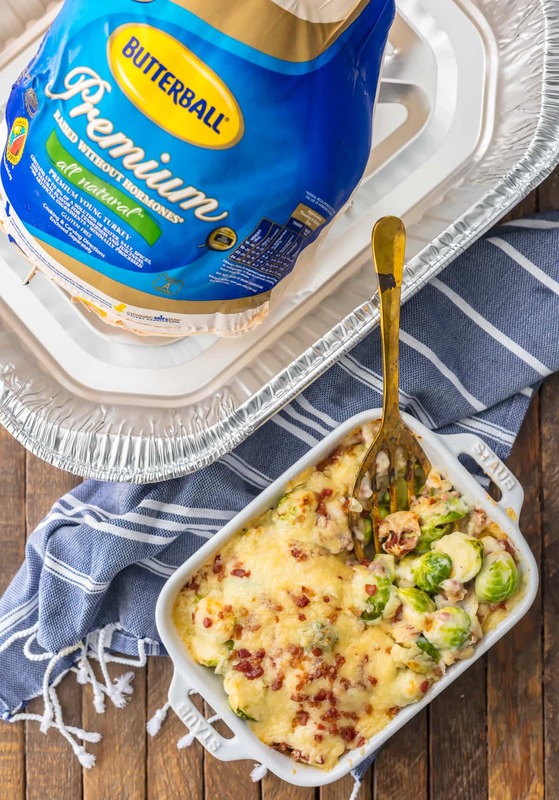 Every family needs that perfect side dish to pair with the star of the show on Thanksgiving, THE TURKEY! I can make sides for days, no problem, but when it comes to the turkey, I still look to the professionals. And by the professionals, I mean BUTTERBALL of course! Is there any more trusted name in Turkey? They’ve always been there for home cooks on Thanksgiving, making sure every one of their turkeys comes out just the way you want it. 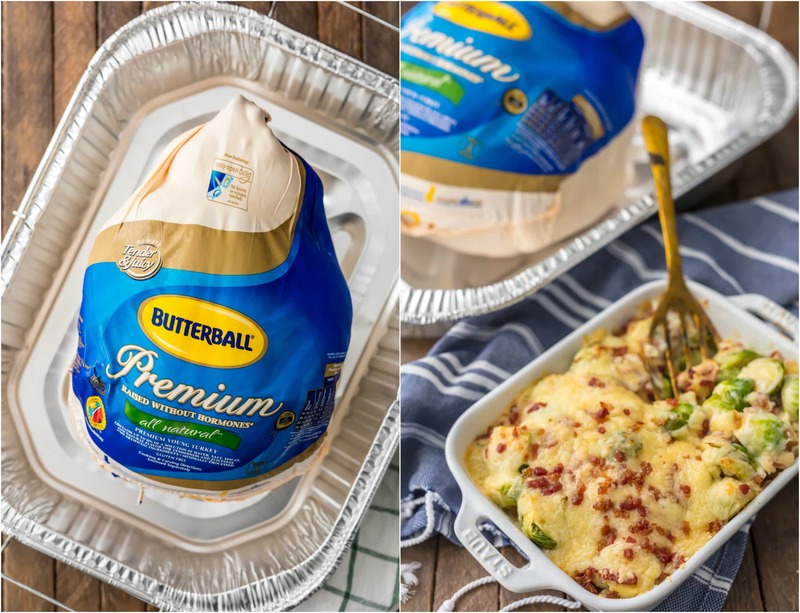 This year Butterball is doing something extra special to make Thanksgiving EXTRA simple. They’re going ON DEMAND with a live text line there to answer any and every question you might have on turkey day. The Turkey Talk-Line is offering 24/7 text help the week leading up to Thanksgiving. Holiday cooks will be able to text 844-877-3456 from November 17-24 for expert advice at the touch of a button. You guys know I’m going to need that. No shame in my game! You won’t need extra help for this Bacon Brussels Sprouts Gratin, because it’s literally made in minutes, but turkeys can intimidate even the most experienced holiday cook. This year we don’t have to be intimidated, because we have constant help on our side! This cheesy Bacon Brussels Sprouts Gratin is super simple. There’s no hassle with this easy Thanksgiving side dish, so no worries here. Just follow a few basic steps and you’ve got a creamy, cheesy side dish dish. This recipe couldn’t be simpler, which automatically makes it the perfect holiday side dish. Bacon brussels sprouts au gratin are just so good, you gotta try them. Check the recipe card below for detailed instructions. 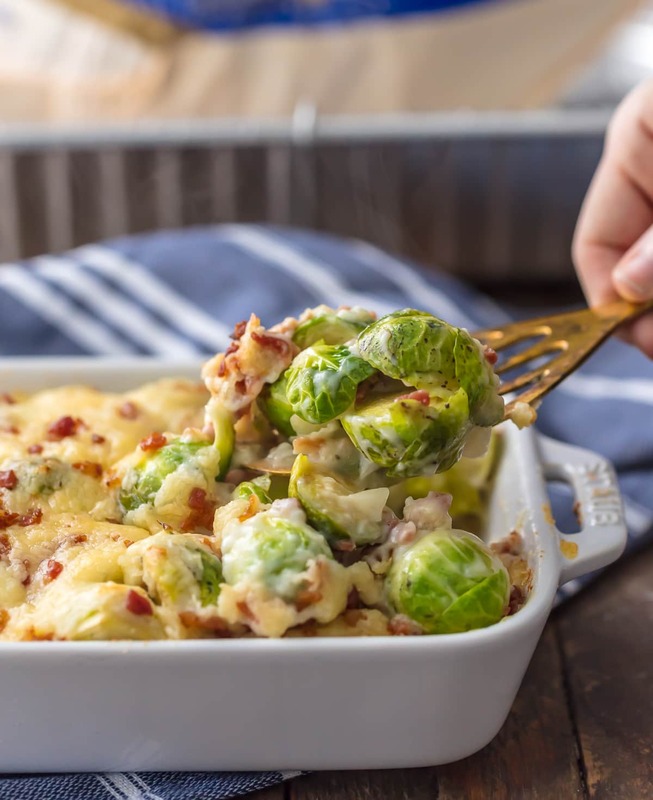 You’re going to love this bacon brussels sprouts gratin recipe this holiday season. Be sure to text 844-877-3456 with all of your Thanksgiving turkey questions, and visit butterball.com for how-to videos based on the Talk-Line’s frequently asked questions. Check out the Butterball Facebook page at: facebook.com/Butterball/ for even more recipe inspiration. Happy Happy Thanksgiving! See the recipe card below for details on how to make Brussels Sprouts Gratin. Enjoy! Bring water to a boil in a large pot. Salt the water. Add in all the brussels sprouts and cook for 6-7 minutes, or until they have turned bright green and are slightly soft. Remove the sprouts using a slotted spoon and place in a baking dish sprayed with nonstick spray. While the brussels are cooking, make your sauce. To make the sauce, melt the butter in a medium saucepan over medium heat. Once melted, whisk in the flour and allow to cook for 1 minute, whisking constantly. Whisk in your milk slowly, again whisking constantly until a sauce forms. Reduce heat to simmer and allow to cook for 5-6 minutes or until its thick and smooth. Whisk frequently while it cooks. Season the salt liberally with salt and pepper to taste, and then stir in the parmesan cheese. Sprinkle the bacon crumbles over the brussels in the baking dish, reserving a bit for garnish. Pour the white sauce over the brussels, making sure to get in all the nooks and crannies. Top with the shredded white cheddar and remaining bacon. Bake for 10-15 minutes or until cheese is fully melted and bubbly. This Brussels sprouts gratin looks and sounds delicious! You can bet I’m going to get some fresh sprouts and make this. Thanks for sharing! Do you think this would work with frozen Brussel sprouts? 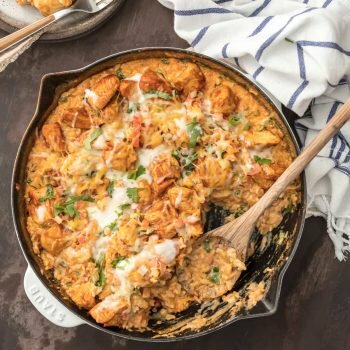 I have a freezer full and this recipe sounds amazing! Ummm…YES! This looks absolutely awesome. brussels sprouts can be so amazing is cooked right. and cooked with cheese and butter is ALWAYS right in my book :-) i think i’d like to add just a touch of bacon to this to make it extra indulgent. Yay! Hope you love it!!! 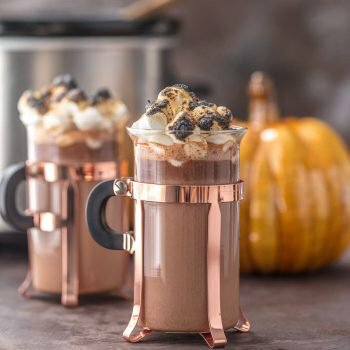 Can I use whole cream instead of skim milk?